Gazing over the San Andreas Fault towards the west from Keys View at Joshua Tree. Not every day you get a desert sunset like that. We haven’t seen many clouds in Southern California since we began this western U.S. National Park odyssey. So we were excited when we drove up today from Los Angeles to Joshua Tree National Park. The clouds just kept building as we traveled east into the mountains. And lo! I think we even saw some of them dropping some rain around San Bernardino. They could sure use it. We stopped in 29 Palms, California, just long enough to check into a motel and then speed into Joshua Tree National Park on Park Boulevard. Ten miles down Park Boulevard, then turn right. Keys View is about a 20-minute drive from Park Boulevard down Keys View Road to the crest of the Little San Bernardino mountains on the west side of the park. Views of the Coachella Valley are just below us, and the San Andreas fault is visible right in the middle of the valley. The Salton Sea barely glimmers off to the south and the reflections off the glass of Palm Springs homes are just in front of us. We were told that on a really clear day, you might be able to see Signal Mountain in Mexico. No such luck today though. We were told this was the best place to see the Joshua Tree sunset. As we got out of the car, this fellow saw my cameras and said, “Look at this!” pointing to some mountain sheep on the side of a hill just about 30 yards from us. “Look at that,” I said. “There’s your picture,” pointing to the west into the sun. We hung around for an hour taking shot after shot of this desert sunset. I got several good ones. But about midway through the hour, this shot happened. The light lasted about three minutes like this and I just kept adjusting the frame, adjusting the exposure and pushing the shutter. It turned out a lot nicer than the sheep, I think. And…this top photo won a couple of awards. It was an Editor’s Choice by National Geographic in their 2015 Photo Contest, and it was a North American Travel Journalists Association Gold Award winner for National Park photography during the Centennial year of the United States National Parks. A lone tree against the same sky–just a few minutes later. 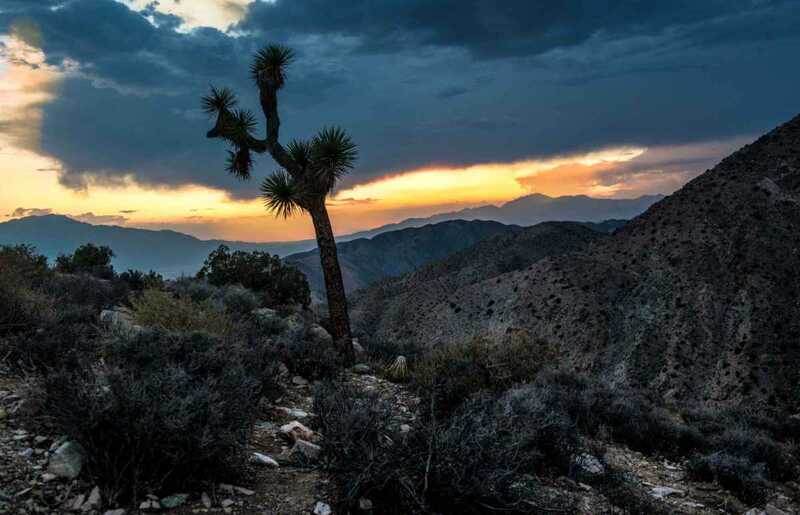 Sunset at Keys View, Joshua Tree provides endless possibilities. And another from near the same spot. As I was walking down the hill towards the parking lot, the sunset was still gleaming behind the clouds. And though this is Joshua Tree National Park, this was the only Joshua Tree in the vicinity. 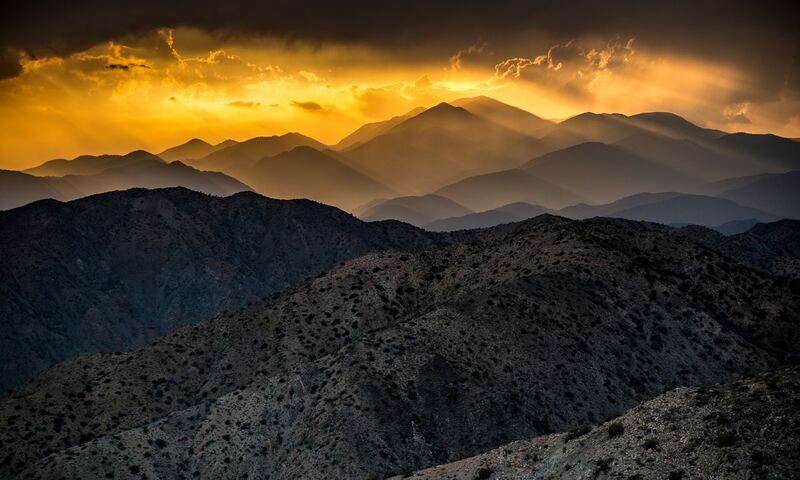 Of all the places I like to photograph, I would have to say the desert is my favorite. All the variety of the sere landscape is just too beautiful to miss. You get the most striking silhouettes in the desert. 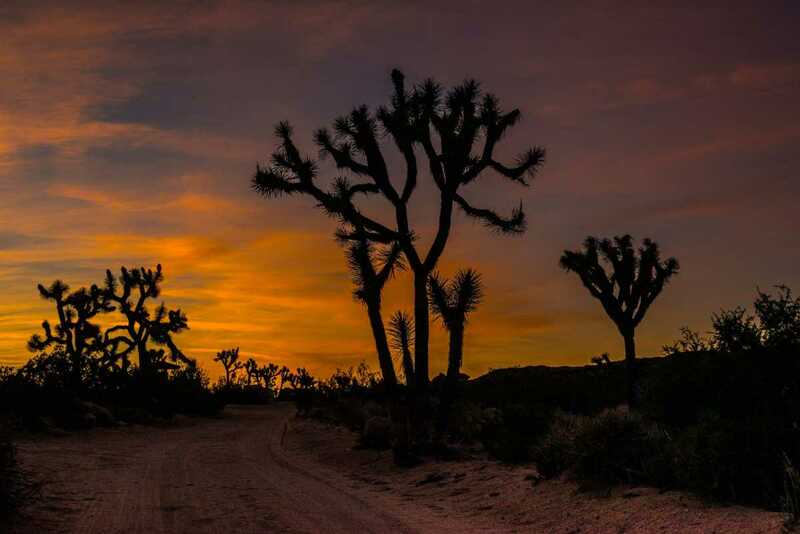 Why are desert sunsets so colorful? The desert, wherever we’ve been, has the most colorful sunsets of anywhere. I don’t know exactly how it happens, but a sunny hot day without a cloud in sight morphs at sunset into a cloudy, moody palette that rewards you for waiting out an entire day that presented bright, but uninteresting illumination. Of course, sunsets everywhere can be spectacular, but the desert sunset is particularly red due to the dryness of the air. Moist air tends to scatter light more. Also, deserts tend to have cleaner air, and therefore allow the light a more direct path to the eye, making the color more dramatic. Finally, the particulates in the air tend to be dust, as opposed to ozone, carbon monoxide, and other pollutants. Dust tends to reflect more red than yellow light, so you get this dramatic tableau rather than a more insipid yellowish cast. And, in general, because light at sunset takes a more oblique route through the atmosphere, there’s more air to get through. So light colors with longer wavelengths, such as red and orange light, are able to penetrate better than light with shorter wavelengths, such as the blues and violets. Now you know everything about desert sunsets that I do. If you’d like to see what the Joshua Tree landscape looked like a few hours later, see Night Photography, Joshua Tree National Park, California. You can see photos from all our visits to United States National Parks by clicking the link. You can help yourself get ready for your own travels by reading our Get Started Planning Your Trip Now page. Particle, dust, whatever…it’s gorgeous! Great shot Tom! Thanks Corinne. Nature does the work. I just push the button…and fool around a bit in Lightroom. Very nice. Love the trees in silhouette. Thanks, Stephen. The shapes of those trees make for some lovely photo subjects.